Guinea pigs, like many animals, thrive when they can enjoy the full-time presence of furry pals in their living quarters. When you acquire a pair of guinea pigs, make sure you know exactly what to look for in happy cavy companions. Never be random in your selection of cagemates. Guinea pigs usually do well when they live alongside another member of their species. They're usually gregarious rodents. Duos of guinea pigs can be successful, and groups of three or four specimens can also be beneficial. Pairs of females can usually get along harmoniously. Pairs of males can work, but only if both specimens have been neutered. Two intact male guinea pigs will battle each other, and often fiercely. If you want a male and female together, neutering and spaying are a must, as breeding is inevitable. 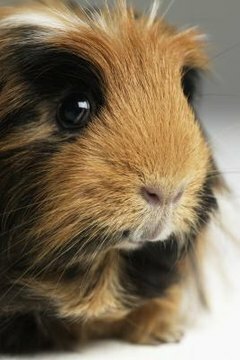 If a male guinea pig is fixed, he can usually live happily alongside at least one female guinea pig. Note that siblings from the same litter are optimal for getting along. If guinea pigs have been together since birth, they might develop a peaceful interaction that's easy not only for them, but also for you, their loyal caretaker. Since guinea pigs in certain groupings are preferable, make sure you're certain of the two animals' genders before you bring them home. Distinguishing between male and female guinea pigs visually isn't too easy a task, and is often particularly difficult when they're juveniles. Just to be sure, get the opinion of a professional, either a veterinarian or guinea pig breeder. If you erroneously think that you have two females together, you could discover later on that they're actually boys -- by witnessing them fight aggressively and violently. Avoid that unpleasant scenario by getting gender confirmation beforehand. When you're looking for guinea pigs to bring into your life, be on the lookout for indications of glowing health. If guinea pigs are in good condition, they should have tidy, thick fur devoid of any red spots or missing clumps. Their mouths, noses, ears and eyes should all be immaculate and free of discharge. Their eyes should also be alert and not hazy. Their bottoms should be clean. If they're not, that could signify issues with loose and runny stools. Behavior also provides clues on the health of guinea pigs. If guinea pigs are healthy, they're usually lively and inquisitive in temperament. If they're not, they might spend an inordinate amount of time sleeping and not moving around much. Noisy breathing also frequently denotes sickness in guinea pigs. Make sure you're well-versed in all of the ins and outs of guinea pig care before bringing your furry twosome home. Talk to a veterinarian about everything from housing to diet. Guinea pigs flourish when they each have at least four square feet to call their own. Spacious cages are advantageous. As far as diet goes, commercial pellets designed for guinea pigs usually are suitable. Grass hay is a guinea pig dietary staple, as well. The wee cavies also enjoy tiny pieces of fresh produce. Some guinea-pig friendly veggies and fruits are peas, apples, blueberries and chards.